Every year, since 2012, we have been awarding the prestigious Best Board & Best Board Member awards. The Best Board award is a team award to appreciate extraordinary work of a collective administration body. The Best Board Member award, on the other hand, is awarded to an individual member of an administration. We recognize those companies that have managed to achieve extraordinary benefits in corporate governance and have contributed in significantly improving the quality of corporate governance. Nominations of teams or individuals for the Best Board and Best Board Member awards can be made by both individuals and businesses. Each nomination must include, in addition to basic identification data, a justification for the award. The winners of the awards will be selected by an expert jury composed of representatives of the members of the Czech Institute of Directors, who will announce the winner at the ceremony. The starting date for submitting nominations is always in the first half of the following calendar year, and the last date on which the nomination can be sent will be announced in due time. It is not possible to nominate members of the Steering Committee and the CIOD Review Committee to the competition. The evaluation of nominated companies is based in their annual reports, publicly available data, and also a personal meeting with representatives of the nominated administrative body. It is not possible to nominate members of the statutory bodies whose members are members of the Steering Committee and the CIOD Control Commission. You can nominate your candidates by August 30, 2018. Category of over 3,000 employees: Česká spořitelna, a.s.
Small and Medium Companies: METALKOV spol. s r.o. 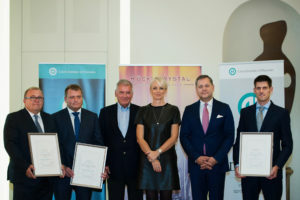 Best Board Member – Best member of the administrative body: Pavel Krtek, M.Sc., Chairman of the Board of Directors and CEO of České dráhy, a.s.
Corporate Governance Star: Ing. Jan Sadil, Ph.D., Member of the Board of Directors of ČSOB, a.s.
Category over 3,000 employees: Kooperativa pojišťovna, a.s.
Small and medium-sized companies: Beznoska, s.r.o. Best Board Member – Best member of the governing body: Jiří Kunert, Chairman and CEO of UniCredit Bank Czech Republic and Slovakia, a.s.
Corporate Governance Star: Jan Klouda, General Counsel of Vodafone Czech Republic a.s.